Carte Generale des 17 Provinces des Pais Bas Ave Leurs Capitales. 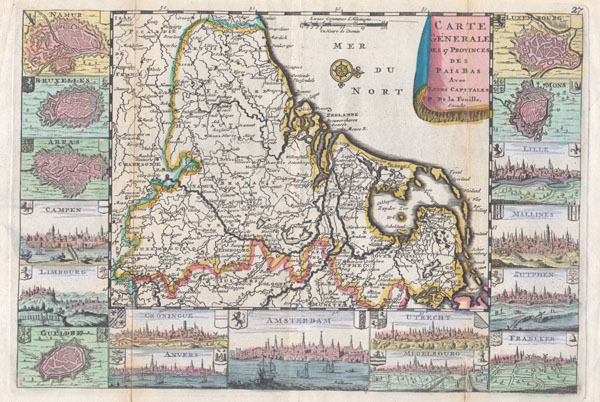 A very scarce, c. 1710, map of Belgium, the Netherlands and Luxembourg by Daniellede la Feuille. The main map is surrounded by seventeen plans and views of major cities in the region: Namur, Bruxelles (Brussels), Arras, Campen, Limbourg, Gueldre, Groningue, Anvers, Amsterdam, Utrecht, Midelbourg, Luxembourg, Mons, Lille, Mallines, Zutphen and Franeker. Drape style title cartouche in upper right quadrant This map was originally prepared for inclusion as chart no. 27 in the 1710 edition of De la Feuille's Atlas Portatif.